Proprietary Name: Leader Sleep Aid What is the Proprietary Name? 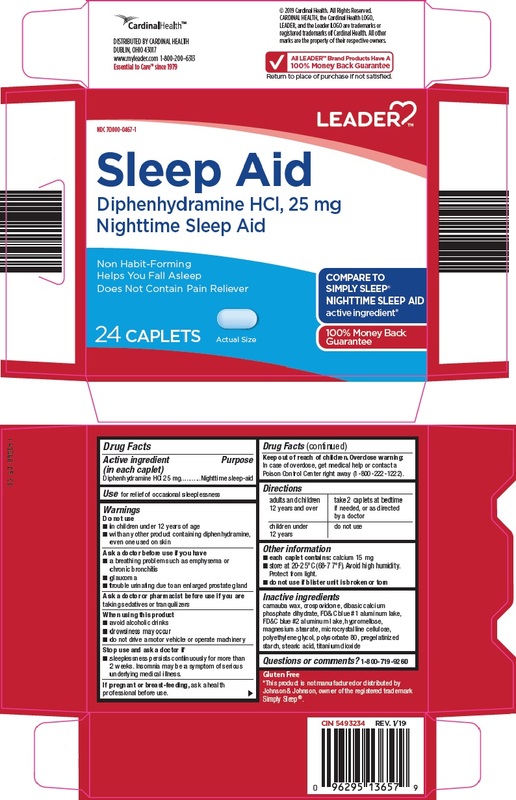 Leader Sleep Aid with NDC 70000-0467 is a a human over the counter drug product labeled by Cardinal Health. The generic name of Leader Sleep Aid is diphenhydramine hydrochloride. The product's dosage form is tablet, film coated and is administered via oral form. •sleeplessness persists continuously for more than 2 weeks. Insomnia may be a symptom of serious underlying medical illness. Overdose warning: In case of overdose, get medical help or contact a Poison Control Center right away (1-800-222-1222).